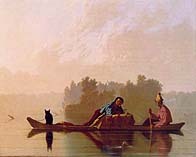 "Fur Traders Descending the Missouri"
Ayers Chapter 1--"Contact, Conflict, and Exchange in the Atlantic World to 1590"
Ayers Chapter 2--"Colonization of North America (1590-1675)"
Ayers Chapter 3--"Crisis and Change (1675-1720)"
Ayers Chapter 4--"Expansion of Colonial British America (1720-1763)"
Ayers Chapter 5--"Wars for Independence (1764-1783)"
Ayers Chapter 6--"Toward a More Perfect Union (1783-1788)"
Ayers Chapter 7--"The Federalist Republic (1789-1799)"
Ayers Chapter 8--"The New Republic Faces a New Century (1800-1815)"
Ayers Chapter 9--"Exploded Boundaries (1815-1828)"
Ayers Chapter 10--"The Years of Andrew Jackson (1829-1836)"
Ayers Chapter 13--"Broken Bonds (1855-1861)"
Ayers Chapter 14--"Descent Into War (1861-1862)"
Ayers Chapter 15--"Blood and Freedom (1863-1867)"
Ayers Chapter 16--"Reconstruction Abandoned (1867-1877)"
Ayers Chapter 17--"The Economic Transformation of America (1877-1887)"
Ayers Chapter 18--"Urban Growth and Farm Protest (1887-1893)"
Ayers Chapter 19--"Domestic Turmoil and Overseas Expansion (1893-1901)"
Ayers Chapter 20--"Theodore Roosevelt and Progressive Reform (1901-1909)"
Ayers Chapter 21--"Progressivism at its Heights (1909-1914)"
Ayers Chapter 22--"The Impact of World War I (1914-1921)"
Ayers Chapter 23--"The Age of Jazz and Mass Culture (1921-1927)"
Ayers Chapter 24--"The Great Depression (1927-1933)"
Ayers Chapter 25--"The New Deal (1933-1939)"
Ayers Chapter 26--"The Second World War (1939-1945)"
Ayers Chapter 27--"Postwar America (1946-1952)"
Ayers Chapter 28--"The Eisenhower Years (1953-1960)"
Ayers Chapter 29--"The Turbulent Years (1960-1968)"
Ayers Chapter 30--"Crisis of Confidence (1969-1980)"
Ayers Chapter 31--"The Reagan-Bush Years (1981-1992)"
Ayers Chapter 32--"From Prosperity to the Challenge of Terrorism (1992-2005)"
General Advanced Placement Review Packets--The following packets have been posted to assist students preparing for the Advanced Placement Exam in May. Special thanks to Susanna of Horace Greeley High School, and Emma Vaughn, Adam Crocker, and Elizabeth Dooley of Polytechnic School. American History Topic Summaries: One-paragraph summaries of the key topics in American history, prepared as a supplement to The American Nation by Mark Carnes.